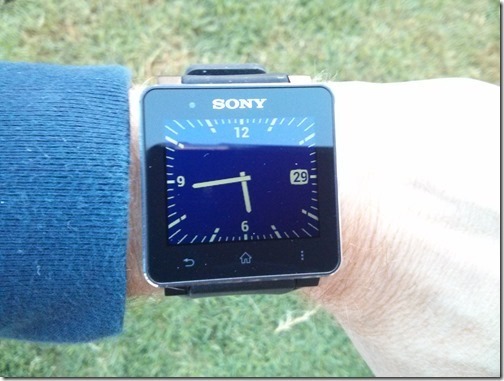 Sony SmartWatch 2 Review: Good, but Will You Use It? 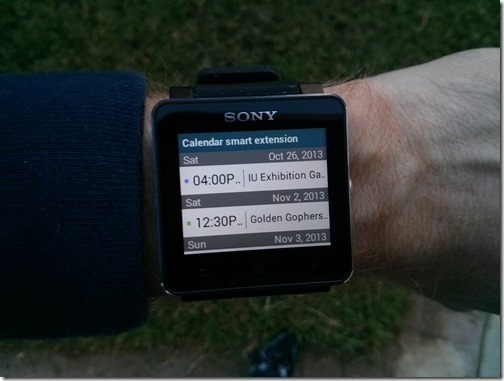 You are here: Home / Reviews / Sony SmartWatch 2 Review: Good, but Will You Use It? 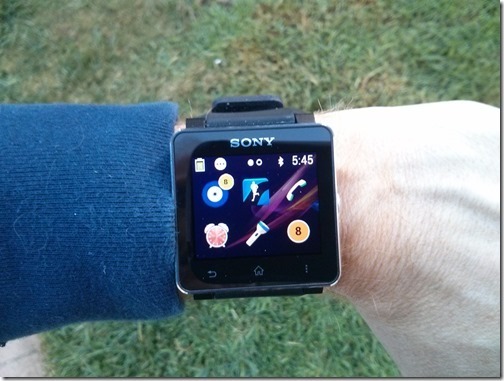 I’ve been using the Sony SmartWatch 2 for a little over a week now, and so far it’s matched up well with what I want from a smartwatch. However, it has one significant issue that gets in the way, and I’ve found myself reconsidering whether or not I actually need a smartwatch, after all. It works well as a watch: The Sony SmartWatch 2 does exactly what I want: it works as a watch with date and time constantly displayed. And, because of the transreflective LCD, it actually shows up best in direct sunlight. Of course, like an unlit analog watch, you can’t read the screen in the dark (although my analog watches have always had glowing faces), and so when lighting is less than favorable there’s the extra step of hitting the button to turn on the backlight. When it matters most, though, I can see the time and date without touching the watch, and that’s a good thing. It can’t be ugly: I’m not that worried about style, but I don’t want to wear something that’s downright ugly. 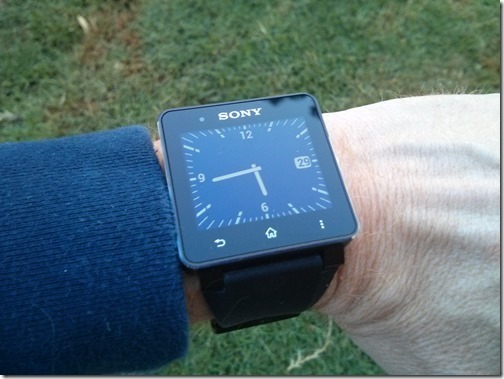 A geeky-looking but minimally attractive watch is fine, and for the most part, that describes the Sony SmartWatch 2. It doesn’t pretend it’s anything but a well-designed gadget, and I’m not embarrassed to wear it. It’s also light and comfortable, and if I get tired of the black silicon band I can always swap it out for one of any of the untold number of standard 24mm bands available. It has basic smartwatch functionality: I specifically did not want a smartwatch with too much many features, such as a camera, speaker, and microphone (*cough* Samsung Gear *cough*). Certainly, I didn’t want a smartwatch that also functions as a standalone cell phone. My reasoning here is simple: the more features, the worse the battery life and the higher the cost. The Sony SmartWatch 2 does well here: it has minimal but sufficient functionality, it’s reasonably priced ($199), and battery life is acceptable. So, overall, the device meets my needs with few complaints. Unfortunately, one of them is pretty significant. 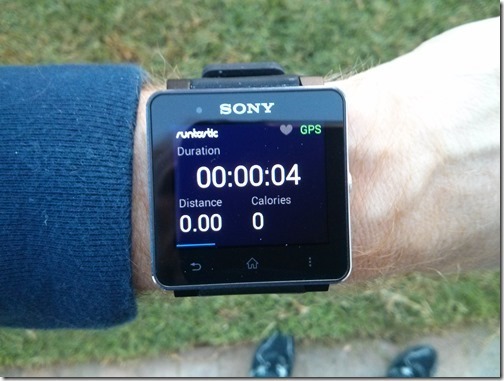 The following is a little more detail on the Sony SmartWatch 2 to maybe help you out a little in deciding whether it will meet your smartwatch needs. As I mentioned above, the SmartWatch 2 is an attractive piece of geekiness. It has the same understated design as Sony’s recent smartphones, with the same general square shape and curved corners. As far as watches go, it won’t win any awards for aesthetic design, but it doesn’t stick out too badly when worn in business and casual environments. I do wonder if it’s a very feminine device. My wife thinks it looks fine on me, but she wouldn’t wear it herself. That might be largely due to the band, however, which on mine is the black silicon version. Maybe with something more colorful, or thinner, it’s something a woman would be comfortable wearing, assuming she didn’t have wrists that are too thin. I’m on dangerous ground here, though—a person’s definition of masculine and feminine might be very different from mine, along with general aesthetic tastes, and so I’ll just say that in my opinion it seems like more of a man’s device than a woman’s, and leave it at that. As far as how it feels on the wrist, it’s almost perfect. It’s light enough to be comfortable, but has enough of a heft that I remember it’s there. I have relatively thin wrists, and yet it’s not too wide (which, from pictures, I think the Galaxy Gear would be). Overall, I’m very happy with how it wears. In terms of quality, it also scores well—mostly. Nothing feels cheap, even the USB port. It’s a solid build, with no gaps or loose parts. The SmartWatch 2 feels like it’s worth at least its $199 list price (less than the $300 I was expecting), and maybe a bit more. There’s one concern, though—I do have a number of minor scratches on the polished part of the metal casing next to the screen, from the bumps and knicks against walls and such that go along with wearing a watch. More on that later. As a standalone device, the SmartWatch 2 can tell the time and date, set alarms, act as a timer, and pretend it’s a flashlight (although really, the backlighting is so weak that it’s worthless in this regard). That’s more than some smartwatches can manage when they’re not tethered to a smartphone or tablet, and it means that the SmartWatch 2 offers at least some value as a watch on its own. 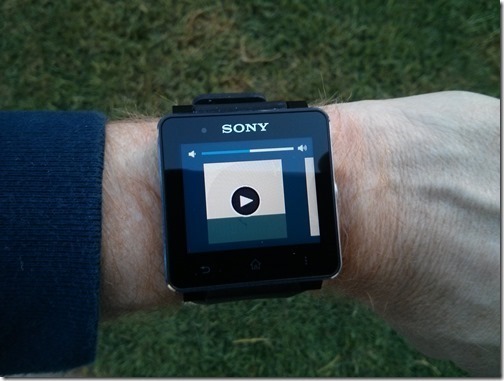 Once paired with a device running Android 4.0 or higher, the SmartWatch 2 becomes an extension of the device. In essence, the smartwatch reduces the number of times you need to either pull your smartphone out of your pocket or open up the case on your tablet. And that’s the principle value of the device—it doesn’t replace your smartphone or tablet, or even necessarily augment either of them. Rather, it serves as a proxy, and if there are ever times when pulling out your smartphone or waking up you tablet are inconvenient or problematic, then the SmartWatch 2 might be worth something to you. 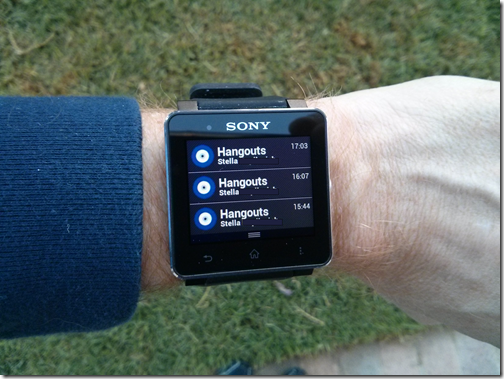 There are two main ways that the SmartWatch 2 functions as a connected device. First, it displays notifications, through a number of apps available in Google Play. You can go the piecemeal route and get Sony or third-party apps for individual functions, like email, Gmail, messaging, etc. Or, you can skip all of them and just get the excellent (and free) app Watchit!. With Watchit!, you can receive notifications from literally any app that’s installed on your smartphone or tablet, and it’s fully configurable. A word to the wise, though: it’s very easy to configure too many notifications, to the point where you start ignoring them. I ended up turning on notifications for tasks, appointments, messaging, and phone calls, and turning them off for email. 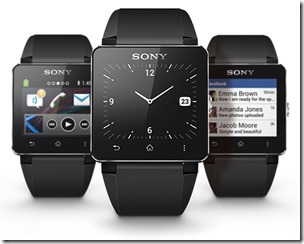 The second primary way that the Sony SmartWatch 2 functions is as a sort of remote control for a connected smartwatch or tablet. You can reject incoming phone calls, mute calls, control a music player (including Google Play Music, albeit without title or album info), and interface with a few exercise apps. I found the music controls the most useful, particularly when walking my dog—no more digging the smartphone out of my pocket to pause or change tracks. In essence, the SmartWatch 2 serves to reduce the number of times you need to touch your smartphone or tablet. You still need them, but you can leave them in your pocket, in a closed case, or out of reach (but within Bluetooth range) and still use them. The watch-device combo doesn’t let you do anything you can’t do without the device by itself, it just lets you do some things more easily. Sony advertises the SmartWatch 2’s NFC capabilities for pairing. I found this most useful when first connecting to my Nexus 4 and then my Nexus 10, with the former being much easier to initially configure than the latter. I turned the watch on, waited for the “ready to pair” animation, then touched it to the back of my powered and unlocked Nexus 4, and the smartphone recognized the watch and offered to download the required apps. It was easy as pie. Connecting to the Nexus 10 was similar, but there’s a trick that I had to use that Sony doesn’t mention. Maybe I was doing something wrong (although I don’t think so), but I had to unpair from the Nexus 4 to put the SmartWatch 2 into the “ready to pair” mode again. After a few tries to get NFC chips to talk to each other, the Nexus 10 connected and downloaded the apps. Once both devices were configured for the SmartWatch 2, the process of switching between them was straightforward if not a little bothersome. First, you have to unpair from the currently paired device, at which point the watch does a sort of soft reset that removes the apps associated with the connected device and gets it ready to pair to a new device. Then, you can simply go into Bluetooth settings on the other device and pair to the SmartWatch 2, at which point the apps associated with that device are downloaded and ready to use. I didn’t bother with NFC beyond the initial pairing, because I couldn’t get it to work consistently and connecting NFC through my Nexus 10’s case was problematic anyways. Pairing manually wasn’t too much of a hassle, and it only required about 30 seconds or so to make the switch. And so overall, using the SmartWatch 2 with multiple devices was fairly painless. I used my SmartWatch 2 pretty consistently throughout the time I was testing it, and I was able to go a full four days on a single charge. Controlling music and monitoring a Runtastic walk burned more power than anything else, and of course the more the backlighting is on, the shorter the lifespan. But that’s a reasonable amount of time between charges, I think, particularly when charging from zero to 100% was very quick—I didn’t officially time it, but I think it was less than an hour. Simply put, the SmartWatch 2 is unusable with polarized sunglasses. Put on a pair, and the watch’s display pretty much disappears. I found myself peering over my sunglasses to read the screen, which was a bit inconvenient. If you use polarized sunglasses, just know that you won’t be able to use the SmartWatch 2 with them. I’m not keeping my SmartWatch 2, even though I generally like it. First, the scrapes and nicks on the bezel started to bother me the more I used it. I have analog watches that I wore for years with fewer blemishes—stainless steel holds up much better than does the SmartWatch 2’s softer aluminum casing. Second, while the watch did its job both as a standalone and a connected device, I just didn’t find myself using it as much as I thought I would. $200 isn’t that much money, but it’s not pocket change, either, and so I simply thought I wasn’t getting my money’s worth. The easily-scratched nature of the case didn’t help things. Whether you’ll get your money’s worth is, of course, up to your own needs. The Sony SmartWatch 2 can certainly earn its keep if you’re constantly reaching for your smartphone or tablet every time a notification goes off or to control your music. That, and if you can tolerate the scratches. I was just wondering how well your smart watch worked with your nexus 4? Is it near flawless or somewhat laggy or anything of that nature. Worked fine. I never experienced any of the lag some reviews mentioned–mine seemed to respond more than quickly enough.